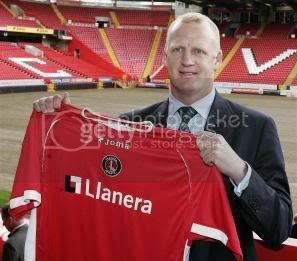 Firstly at 1200pm Charlton had a press conference unveiling Dowie as the replacement for Alan Curbishley. After many questions about him leaving Palace and talking about Charlton, a Palarse representative interrupted shouting out that they are issuing a Writ towards him as he left Palarse under false claims saying he wanted to move up North. But as Dowie said he wanted a "New Challenge". Jordan blabbed his mouth on Sky Sports News after the conference and started shouting his mouth out about Dowie and Charlton. To be honest, men like Jordan do not need to be in this game, but Iain has chosen to join a much better club!